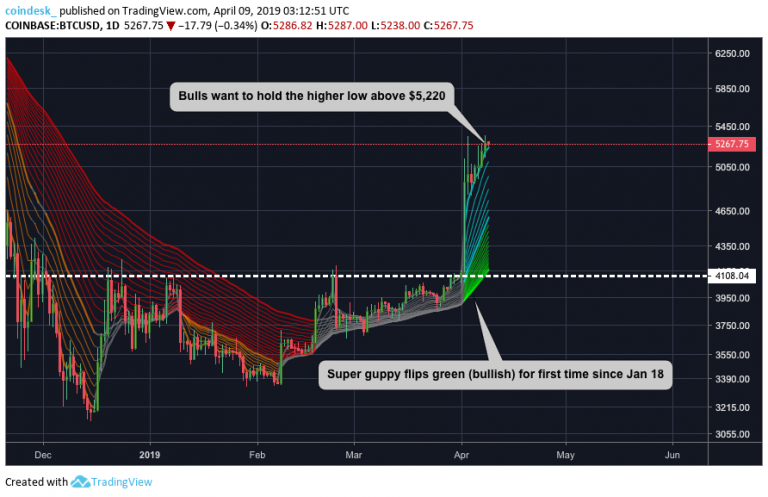 Bitcoin’s “super guppy” indicator has turned green for the first time since January 2018 in a signal confirmation of bull bias on the daily chart. The long-term 26-period EMA on the monthly chart has been crossed from below, signalling that the move above $5,200 has placed bitcoin in an official bullish upswing. The monthly RSI has climbed over 50 in another indication that momentum currently favors the bulls on long-term timeframes. Bulls need to keep prices above the 26 EMA (currently at $5,064) and the recent dip low of $5,133 to maintain momentum. Several bitcoin price indicators are turning positive on the charts, hinting at growing bullish momentum as the bitcoin block reward halving in 2020 edges closer. For one, the “super guppy” – a combination of exponential moving averages designed to signal when price action flips from bearish to bullish and vice versa – has flipped green on the daily chart for the first time since Jan. 14, 2018. Further, the 26-period exponential moving average (EMA) on the monthly chart has once more turned bullish, having been crossed to the downside in November 2018. The level was hard fought for and won over by the bulls early this month when the price of bitcoin (BTC) shot to $5,000 and then $5,200, crossing above the key EMA then bullishly planting its flag above it. The shift is a welcome development for the bulls, who’ve managed to steer prices away from the recent monthly low of $3,194, last seen four months ago in December 2018, all the while slowly mounting pressure against the bears. 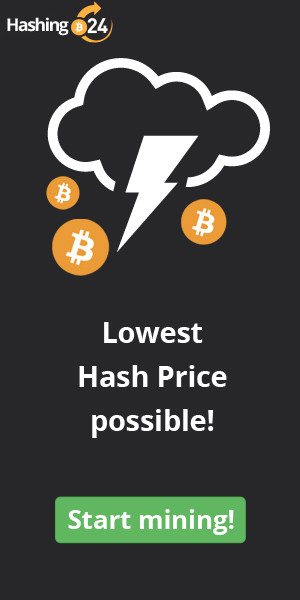 At press time, BTC is trading down 1.4 percent for the session at $5,159, according to CoinDesk’s Bitcoin Price Index. As mentioned, bitcoin’s super guppy has flipped green on the daily chart after a year and more in the red. The shift is a telling sign that the bulls have solidly regained control of the markets and will continue to do so as long as they keep prices above the psychological level of $5,000. Besides November 2018, the last time bitcoin fell below the 26-period EMA was way back in December 2014, when prices dropped below that line for almost a year before finally crossing back above – a move that flagged a new bull run. 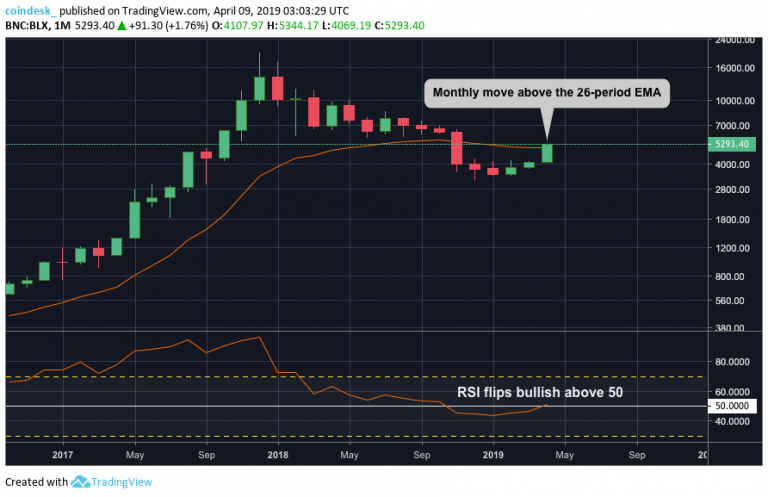 Supporting the trend change on the monthly chart is a shift away from bearish conditions above the neutral 50 line on the RSI, showing momentum is now back with the bulls after a decline since the market peak in late 2017. If prices manage to sustain those two key indicators, it would go a long way to restoring full market confidence and potentially attracting larger pools of investors. Total volume will also be important in the coming weeks as longer-term traders would like to see a steady increase in growing (bullish volume) on the next leg up.